The ultimate guide to G-P ski holidays. Bursting with Bavarian charm, the twinned villages of Garmisch-Partenkirchen and their neighbouring ski areas form Germany’s most famous ski resort. The lovely old villages of Garmisch and Partenkirchen were chartered as one town - Garmisch-Partenkirchen - in the thirties, and can be found in the foothills of Mount Zugspitze, Germany’s highest mountain. With the Partnach river running between them, both are beautifully Bavarian, like real-life fairy-tale towns. Partenkirchen’s the older half, complete with cobbled streets and colourful inns with wooden shutters and frescoed outer walls (take an amble down Ludwigstrasse and we challenge you not to go gaga for the quaint architecture…). The Garmisch half’s the livelier, with cool bars dolling out gallons of Glühwein and schnapps and big name shops like H&M and Jack Wolfskin. Restaurants serve fare from all over Europe and beyond – German, Italian, American, Thai you name it. The town belongs to the exclusive Best of The Alps group of classic mountain resorts (others include Lech, Cortina and St Moritz). Another label worn with pride is the Heilklimatischer Kurort, which marks G-P as a health resort. The place has history and culture in spaces: the Winter Olympics took place here in 1936, making history with Hitler and a strong Nazi presence in attendance. Many an Alpine Championship and Kandahar race has taken place in the area. Composer Richard Strauss also lived in Garmisch for over forty years. When it comes to getting here, the Austrian Innsbruck Airport is only an hour to the south of the resort, which Munich’s an hour and a half’s drive north, meaning airport transfers are short and ideal for families or weekend breaks. You get two ski areas here, served by separate ski passes and with 60km of pistes between them: a larger, lower one called Garmisch Classic that spans the mountains of Hausberg, Kreuzeck and Alpspitze and another - Zugspitze - that’s half the size but on glacial terrain with Germany’s highest pistes. Up at 1310m on the Hausberg slopes in the Garmisch Classic area, beginners can learn the basics on gentle, easy-going slopes. The Kinderland zone near the mountain station has a magic carpet lift and easy T bars to get things started on – and it’s nice and near the Drehmöser 9 ski lodge for rewarding and warming food and hot chocolate. Favourite blues to progress onto include the long and scenic #2a and 4 in the Zugspitze area. At the other end of the scale, the expert-only Kandahar ski slope in the same area has a gradient of up to 92% and totals over 7km in length with 1800 metres difference in altitude. It’s a beast to tackle, but also a real adrenaline boost to follow in the trails of the world’s best skiers. Between the two, there are some super red runs from Osterfelderkopf and Kreuzeck in Classic and more from Zugspitze’s Wetterwandeck and Schneefernerkopf. You can ski back to base on the #1 red in the Hausberg area, which is flanked by thick, pretty woodland. For freestylers, the Park am Hexenkessel can be found in Classic’s Kreuzalm area, covering 6500 square metres with nine boxes, kickers and rails. And in the off-piste department, a guide will be able to show you some super powder runs on the glacier and Osterfelderkopf. There are 110km of cross country runs – a mix of skating and classic and all free to access. Peaches is one of the best places spend an evening, with indoor and outdoor areas, a DJ, a casino and amazing cocktails. And the Irish Pub is another favourite, with live bands, screens for watching the rugby and good-priced drinks. For old school Bavarian nosh, we like Wirtshaus Wolpertinger (try their schnitzel platter and apple strudel) and Wildschutz (top notch spätzle and haxen). Colosseo is one of our favourites for pizza, with La Baita being a close contender. Anyone with a sweet tooth simply must visit Chocolaterie Amelie, which sells every type of chocolate you could dream of… And then some. If you’re celebrating a special occasion, VAUN do fine dining fusion food. Or for no-fuss, super tasty burgers, visit Local Cure. You’ll find a bundle of other activities to enjoy off the pistes, including ice skating and horse drawn sleigh rides in Berwang and Ehrwald, night time tobogganing at the Erhwalder Alm and moonlit hikes in Lermoos. When is the best time to ski Garmisch Partenkirchen? With two ski areas, one glacier and top heights of 2720m, plus artificial snowmaking on certain slopes – the ski area is well set up for catching and holding onto the white stuff. The taller ski area is the Zugspitze, which with a glacier and south facing orientation is sunny and snowy (average depths around 3-4m). The Garmisch-Classic part is lower, but has northeast facing pistes that don’t get the brunt of the heat when the sun’s out. Most years, the lifts run from December to April. Not many places feel more festive than Christmas in Garmisch-Partenkirchen, when the gorgeous Bavarian streets are overflowing with Christmas charm. Enjoy old-school winter fun like one-horse-open-sleigh-rides, ice skating and tobogganing. A health resort, a ski resort and an insanely pretty place to boot, seeing in the New Year in Garmisch-Partenkirchen will set January off to a marvellous start. Look out for fireworks and ski jumping events which bring a brilliant atmosphere to the town. Families are catered for amazingly in this neck of the woods, making Half Term in Garmisch-Partenkirchen a super choice. 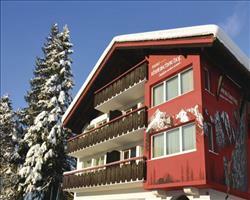 Escape the daily grind for a snowy Bavarian wonderland and come home refreshed, well fed and with fabulous memories. Easter in Garmisch-Partenkirchen is all about having a relaxing time in the mountains. Easter Sunday’s a quiet one for quality time with friends and family, while the pistes up on the Zugspitze are usually in good nick at springtime. Under sixes have been able to ski free with a full paying adult on recent years, and half day options are available for parents juggling skiing and childcare. There are oodles of winter wonderland activities to enjoy together, clip clopping around fairy-tale streets in a horse drawn sleigh, or delaying bedtime for the spectacular night ski show (usually on Mondays in Lermoos). It might not have the biggest ski area or wildest après ski in the alps, but GP can make for a super group holiday. While keen skiers and snowboarders roam the Classic and Zugspitze ski areas, non-skiers can explore the historic streets with their frescoed old houses and charming chocolate shops. There’s a cracking range of restaurants to visit in the evenings, pleasing even the fussiest eaters with a combination of local fare, Italian favourites, burgers and posher nosh.